It was Saturday evening My youngster, Happy Meal, and I (based on a tip from a friend) decided to try the burger at Luna Park over on La Brea in Los Angeles. I called ahead to make certain that Head Chef Nick Cobarrurias would be on hand that evening. 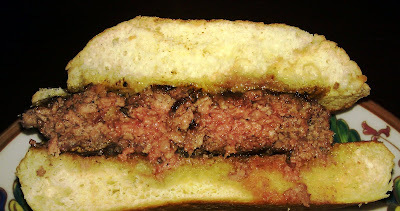 We drove past the original Umami Burger to get there, so we had a fallback in the event that the burger was inedible. The burger was just fine at Luna Park. I thought the music that they piped in was interesting. I hadn't heard Erasure's "Chains of Love" in some time. Luna Park was named for an amusement park on Coney Island where the restaurant's owner took his son when he was young That park had been closed down and was recently resurrected in 2010. If you showed up at an off hour, you would find street parking at Luna Park. Otherwise, there is a valet service. We found the service at Luna Park to be exceptionally attentive, knowledgeable and competent. I ordered the “Tasty Burger” at $13.75, and I had them add the Cheddar for an extra buck. Our food arrived in about 15 minutes. 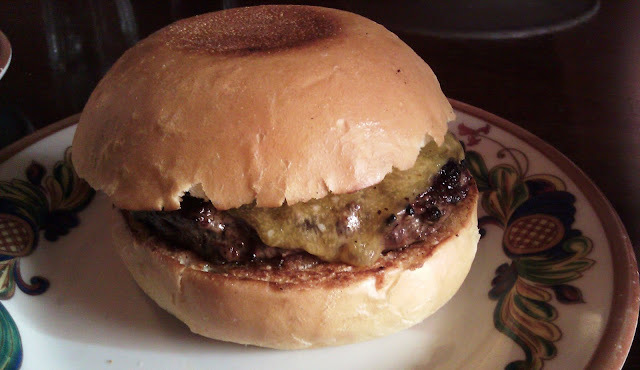 The Beef: Luna Park used Myer's Ranch beef. It was ground in house. This was a blend of Brisket and Chuck. It was juicy, beefy, and the texture was marvelous. The brisket lent a really nice firmness to the bite. The funk from the aging came through nicely. Finally, the beef was not greasy. The beef was a solid win. 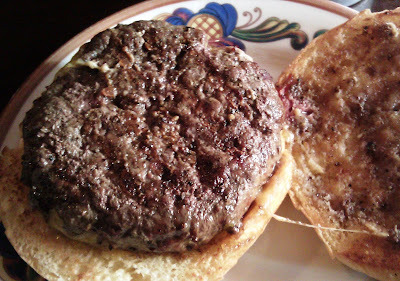 The Sear: Meh...the sear was mediocre on this burger. They cooked the thick 6-7 ounce patties over a gas grill, and the grill was not up to the task of getting a crisp sear onto the beef. Seasoning: The salty seasoning was generously/heavily applied to the exterior of the patty. Preparation: The beef was freshly ground at a medium setting. It was hand-formed into thick patties. The beef was handled gently so as not to create chewiness. 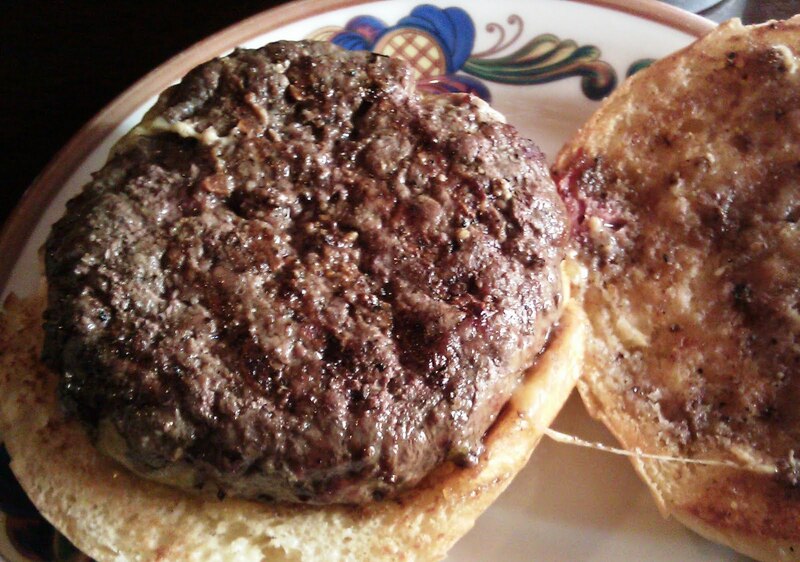 They grilled the burger to a perfectly juicy Med-Rare. Cheese: The Cheddar really got lost in the dish. It was completely absent. The beef was firm and flavorful, and the meek Cheddar contributed nothing but calories. The Cheddar can be safely skipped when it comes to the Luna Park "Tasty Burger". Bun: The brioche from Melrose Bakery was fresh, moist, and perfectly toothsome without being chewy. It provided just enough sweetness and yeastiness to the bite. This was the perfect bun for this burger, and it was one of those rare cases where toasting the exterior of the bun worked. The Meat To Bun Ratio: The bun won this contest. For a bun of this size, an 8 ounce patty would have been appropriate. 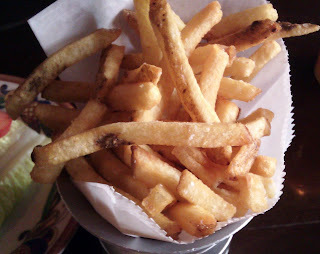 Fries: The house-cut fries were superbly crisp and golden brown. These were cooked in a blend of corn and canola oil. They were perfectly seasoned. Toppings: Romaine lettuce, red onion, and tomato slices came with the cheeseburger. The tomato and red onion were remarkably fresh. The romaine lettuce had lost its crunch and had begun to wilt. Value: This was a good burger made from great ingredients, but it was nearly 14 bucks--15 with the bland cheese. The value was a little below average at Luna Park. The burger was quite good. It wasn't amazing, but it was far above average. Happy Meal ordered pizza, but once he tasted my burger, he decided that he really meant to order the burger. He ate half of my meal. Burger Review : Luna Park prepared an above average, but pricey, burger. A $15 dollar cheeseburger should have been flawless. Umami Burger was cheaper, better, and three blocks to the South. I hafta tell ya, your pictures are the biggity bomb! Are you using a 1,000,000 megapixel camera? I'm using an HTC Evo Shift. It has a 5 MP camera with built-in flash. My old Samsung Lotus was weak sauce in comparison.